What could be better than Outdoor Wednesday this time of year? Things outside my window are absolutely beautiful without me even trying. The woods are leafing out, the birds are singing, the frogs are REALLY singing. It makes my heart feel lighter! Little window trough under my laundry room window. Window trough on my patio. Can you see the little plate planted in the dirt? Inspired by Ramona! My very favorite - red geraniums. See that white foam on the pond? The pond pros tell us that it is fish eggs. I sure hope they are right. We've never had it before. Thank you for coming by. Thank you Susan at Southern Daydreamer for organizing us. I enjoy reading your sweet comments. If you have any input about that white foam I'd love to hear it! Love the red geranium......I picked up a hot pink one for my front porch. I'll have to see if I can post a few pics tomorrow of my work. Love the window box, too, with a plate in it! I love geraniums, especially those on your banner. Your new banner and wallpaper are absolutely adorable, so cheery and happy. Love the caladium in your window box. they are such interesting plants -- such amazing foliage. Lovely pics... and who doesn't LOVE red geraniums? Your new banner is awesome! Your plants look great. Can't wait to get ours planted this weekend. I'm planting geraniums too! Oh boy....you have been busy gardening. Those red geraniums sure do add curb appeal. Morning, Stacey! Oh, how lovely everything is! Your pond is magnificent! I love it all! Your new blog dress is darling, too! Fish eggs! That's pretty neat I hope so too! I love the red geraniums! Keep us posted on the fish eggs, how neat! Your plantings are looking great, love those window planters. Stacey, I LOVE your new header picture!! Red geraniums are one of my absolute favorite flowers. My mother always planted them. They brighten up every flower bed and pot. You have so artistically planted each pot. I am looking forward to seeing them grow. I really like your fish pond. Beautiful, relacxing post today. Gorgeous, Stacey! You can never go wrong with red geraniums in my book! Wow...if those are fish eggs, you're going to need a bigger pond! LOL! Love the plate planted in the trough. So many pretty flowers. Interesting about the fish. Thanks for sharing. Your boxes and planters are going to be so gorgeous come June! You have a lovely blog. Everything at your place is looking good ~ from your new blog design to your flowers and pond. How interesting about the white foam. Keep us posted. I definitely need to redo my window box. It currently has a couple of weeds sprouting. It is next on my list. I saw that white foam the other day! I thought it was just from the water gurgling from the spitters. Maybe this is what it was, that you're describing. It didn't fill up the whole pond, just one end. At any rate, window boxes seem so romantic. Love them. First of all let me tell you how in live I am with your new blog design. It is THE cutest I have ever seen! Seriously! I am going to have to click on you several times a day just so I can look at the cute header and background. I need to get some iron planters like yours and get busy planting. I actually have one, I just need to find a place to hang it. I love geraniums too, of course, because they are red! I meant how in love, not how in live. I hate mistakes when I type! Stacey, Love the new Blog. and your post for today is beautiful. Edmond is not too far from Texas, so we will still consider you one. Will be waiting to see the baby fish. Wow Stacey that is alot of fish eggs !! I love geraniums too. One of my favorite flowers. I love your new blog dress ! I LOVE your new blog look...too CUTE! All of your plants are BEAUTIFUL!!! Did you get any rain in your area today? It poured like crazy around here for a couple of hours and is still thundering. We definitely needed it!!! I just love your header and your blog. Love those red geraniums also. Happy Outdoor Wednesday! Hello. I do believe this is my first time visiting your blog. I love your geraniums. :) I love your pond too. Geraniums make such a beautiful photo. your yard looks great. thanks for sharing. Your planting looks wonderful. I do love the geraniums. They are so hardy in the heat of summer. I have been planting too but not flowers. I am waiting for Mother's Day to do that. Hopefully there will still be some left to purchase. I just totally love your pond. What a wonderful place to sit by and enjoy the nice weather. I bet you will get a lot of use out of it as the weather gets nicer and nicer. So beautiful!! I love all the obvious work you've put into it! Your yard looks fabulous. I need to plant all weekend. And your blog facelift makes me smile everytime I see it. Gorgeous...absolutely gorgeous! Love your garden design but the pond is the star. 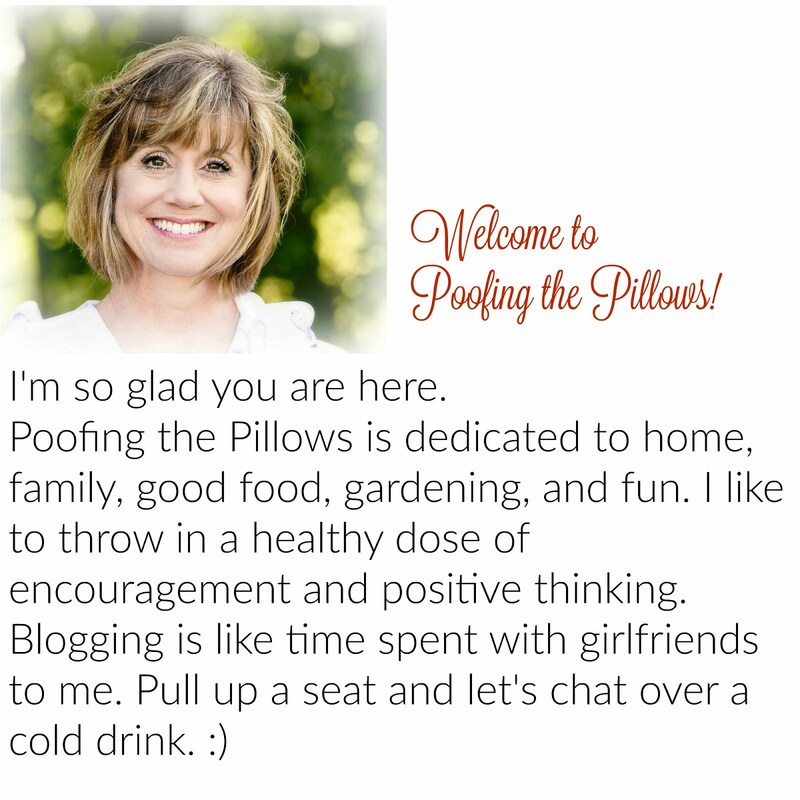 Stacey, I love your new blog design ... it's so pretty and cheerful. And speaking of cheerful, your geraniums are beautiful there beside your gorgeous waterfall and pond ... and I love the little picket fence in the background ... so pretty! I hope you will have lots of baby fishes you can share with us soon. Love your pond and your blog! I'm going to add you to my blogroll!